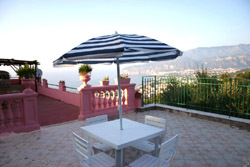 Ornella Villa is an apartment located 4 km away from Sorrento center, on the first floor of a nice villa from where You can enjoy a nice sea-view. 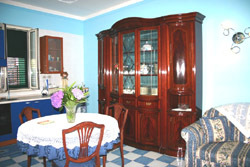 Ornella Villa was renewed at the beginning of the year 2006 and is furnished tastefully. Ornella Villa is surrounded by flourishing vegetation and it is ideal to those people who look for a relaxing holiday away from the crowd, but at the same time they wish to visit the nearby touristic places such as Pompeii, Capri and Naples. 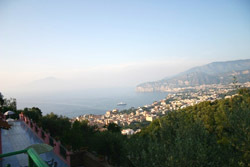 From the wide terrace of Ornella Villa it is possible to admire the enchanting view of the Sorrento Coast and of Vesuvius in the background. 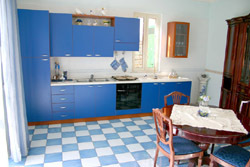 Ornella Villa is particularly suitable to those people who own a car as it is away from the center. Two-roomed apartment of 60 m 2, sleeps 2 + 1, is composed of: autonomous entrance, large living-room with a sofa-bed for 1 person and cooking corner, double-room, bathroom with shower, another bathroom (with sanitary fixtures), 2 wide terraces equipped with table and chairs (one terrace is equipped with a shower), from where You can enjoy a splendid view. 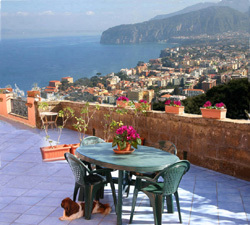 Satellite Tv color - Supermarket, bar and restaurants in the surroundings Sorrento center is 4 km away.